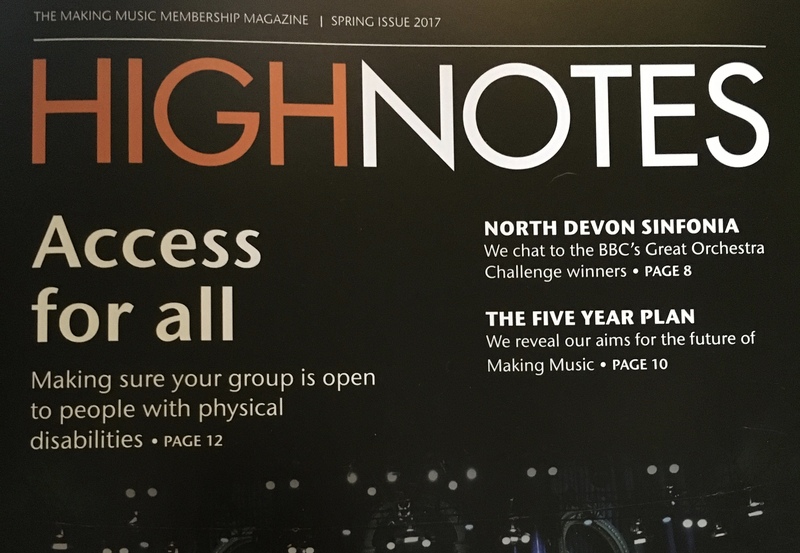 I’ve been published in High Notes, the Making Music publication. It focuses on making music groups accessible to people physical difficulties. I have written extensively how playing in a band has made me a much better musician, but also how it has helped me to win back my sense of self, and something to focus on other than just being ill. It has helped me to make new friends and I adore going to band each week. This Wedesday was a very bad day for me (it’s the cold and damp), I struggled to get out of bed and I had to have a bath to make the pain bearable. I was drunk walking everywhere which is where I stagger about even with my walking stick. None the less I went to band in the evening, even though I felt dreadful. We working on brand new pieces and they are all geeky, which is fantastic as it means I actually know the music. There is nothing like playing music in a group, it creates a resonance in me which is difficult to describe. I can tell you that I was grinning about ten minutes in. Being self employed means that for the most part I work at home, on my own. This really suits my temperament, but being in the band means that I get to see people regularly. I have also made some really good friends too. It is imperative that everyone who wants to be able to take part in playing or singing in a community group is able to. 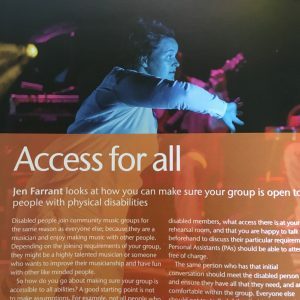 The article covered practical steps which everyone can do – like making sure rehearsal venues are accessible, that there are chairs available, but attitudes are just as important. Such as being open to people with disabilities joining and asking how you can help, rather than making assumptions, or decisions on behalf of people. I provide consultancy for organisations, as well as writing on a variety of topics. 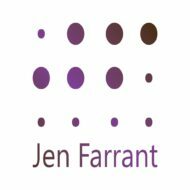 Get in touch if you would like to work with me Jen AT JenFarrant DOT com.